This Guide will provide a seller or buyer with enough information to determine that the Old Country Roses china pattern or piece in question is genuine, correctly described and from approximately when it was manufactured. The design was a result of years of work by Harold Holdcroft who said; We decided to incorporate all the ingredients we knew would be acceptable, richness of colour, softness of colour, good quality and a good value look. All these qualities are incorporated in the pattern. It has lush deep red roses, warmth from the tea roses, delicacy from the bluish pink and an overall softening off of the pattern by using a shade of soft warm green. The rich gold stipple trim gives the sprays continuity and the china good value for money. Enhanced by the elegant traditional Royal Albert Montrose shape and the attractive scalloped edges finished in 22k gold, from the twist and curl of the teacup handles to the fluted trim on the teapot lid....the attention to detail has contributed to a superb original design. After checking literally thousands of listings, these five backstamps seem to be the only English manufactured range. The first four were used for tableware and the fifth for specialty and gift items. There is an additional backstamp which mentions "ENGLAND" but also says "MADE UNDER LICENCE" and it is strongly suspected that it would be in Asia, not another company in England. I think this best explains the four production periods and shows that the only difference from the original period was to either the top or bottom line and then the specialties had "Made in England" instead of just England. All pieces were made by the same production process and look the same unless you turn them over and look at the backstamp underneath. 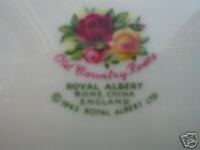 It is not known at this stage which came first, however because both use the name ROYAL ALBERT without the (r) registration mark, we can safely assume it was after 1973 and before 1993 which was the year ROYAL ALBERT was registered as a trade mark. 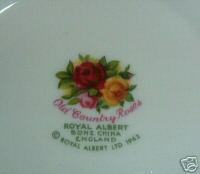 The company of TC Wild & Sons Ltd was renamed Royal Albert Ltd in 1970, but ownership did not change until July 1972. It could be possible that the (c) ROYAL was used in that time and the (c) 1962 was used by the new owners Royal Doulton from July 1972 onwards. More research in the near future will confirm this. The major difference from other English backstamps is the (R) trade mark registration character located after ROYAL ALBERT. The trade mark ROYAL ALBERT was registered in 1993, which was also the year that Royal Doulton demerged from the Pearson Group and listed publicly in their own right on the London Stock Exchange. This period of some ten years represents the last of the English produced china in the district of Stoke-on-Trent, Staffordshire England. Whenever a product was too good to discard but not good enough to meet the factory's first quality standard, the backstamp was scratched or marked and then either given to staff or sold in staff or retail stores at a discounted price, usually 50% or even more. The method of marking the underside to indicate a second was varied. It would have depended on what stage the flaw was discovered. The backstamp transfer could be partially cut or pinholed. Common flaws of seconds were; mis-alignment of graphic transfer, size variation, glazing or gilding flaw, a minor impurity or firing pitting, colour variation etc. Please note that gilders often put a test mark on the back/bottom....it does not indicate a flaw, it was simply used to test the gilding or sometimes to identify the production team. Do not believe a claim that a second quality is as good as a first quality, the seller is just admitting that they cannot see the flaw. The item became a second for a specific reason. It may have been minor but it was enough for the manufacturer not to risk their reputation. You would be surprised just how many seconds were manufactured of this pattern. Can you explain in more detail why you have described this item as mint condition and what is your return policy if we do not agree with your claim? Is this an actual photo of the item and it's backstamp? It is an item that was rejected by the factory's quality control staff as unsuitable for first quality specification and sale. It could have been a glazing flaw, mis-alignment of one of the graphic transfers, a colour variation, a firing or gilding flaw, variation in size, placement of handle...the list could go on. Please note that gilders often put a test mark on the back/bottom....it does not indicate a flaw, it was simply used to test the gilding or sometimes to identify the production team. 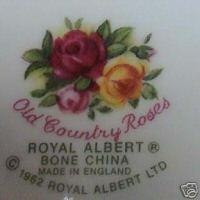 Production in Asia started as early as 1998 and by December 20, 2002. most of Royal Albert's production including Old Country Roses, was transferred to Indonesia, and some to China. Indonesian backstamps are mainly detectable by the absence of the word ENGLAND. Apart from that, they look the same as the English one to the untrained or unwary eye. "Bone China" is replaced with "Made in China"
As you look at the various photos on this page, you will notice that most of the Asian backstamps look very similar to the English backstamps and so to the unwary eye, it is easy to make a mistake. Most important of all is that whenever you do not see the word ENGLAND on a backstamp, you can be sure the item is Asian and most likely INDONESIAN. 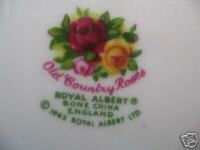 According to various sources, Royal Doulton announced on December 20, 2002 that all Old Country Roses production would be transferred to their joint factory , distribution and marketing venture with the Multifortuna Group in Indonesia. This is not entirely accurate as there are backstamps for product made in China with a 2003 copyright marking which proves that some production was transferred to China. Whether the Chinese factory is part of the Multifortuna Group is not yet confirmed. The copyright years found on asian produced OCR are 1962, 1998, 1999, 2002, 2003, 2004. 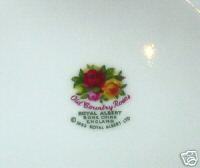 And of course, Royal Doulton was taken over by Waterford Wedgwood in January 2005. 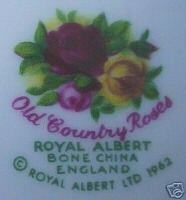 This is the sixth owner in the 44 years existance of Old Country Roses.